This is just a quick check in post because I've been MIA for a few weeks. I'm still here but just busy with study and other things that tend to need attention. I do miss posting though and I'm trying to think up some posts to do in the next few days. 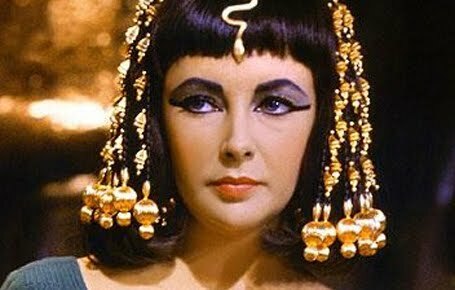 In the mean time I'm posting a quick look I did while deciding what makeup to use for a Cleopatra themed halloween costume. 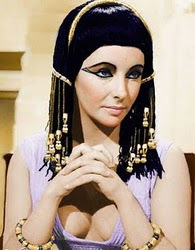 I took my inspiration from the Elizabeth Taylor Cleopatra look. In the movie she wears quite a few different variations of the same look. The basic elements are a bold eyebrow, shadow that goes from lid to brow bone and a very dark, long, thick dramatic eyeliner. She uses different coloured eyeshadows and the eyeliner flicks out in various ways. I've included pictures of the four different eyeliner flicks I could find. I decided to go for teal coloured eyeshadow with the flick that ended with an open triangle. I was going to stick with gold but I always wear gold and I thought I'd just end up looking like... well, me but just a bit more dramatic. I wanted something quite out there and in your face so it was easy to tell that I was wearing a costume. The colouring came out a bit patchy but this was just a trial. 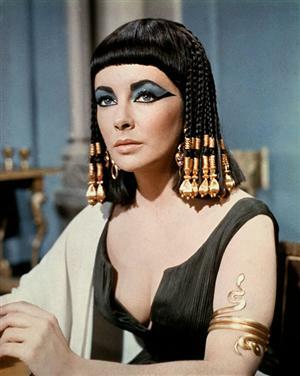 If I decide to stick with the Cleopatra costume then I'm definitely going to be putting a lot more time and attention into making the look more even and not so rough. I used mainly MAC A Bluer Blue eyeshadow which is a frosty teal green and I used MAC Soft Ochre paint pot as a base. A green or blue base would have been ideal but I don't have one as yet. 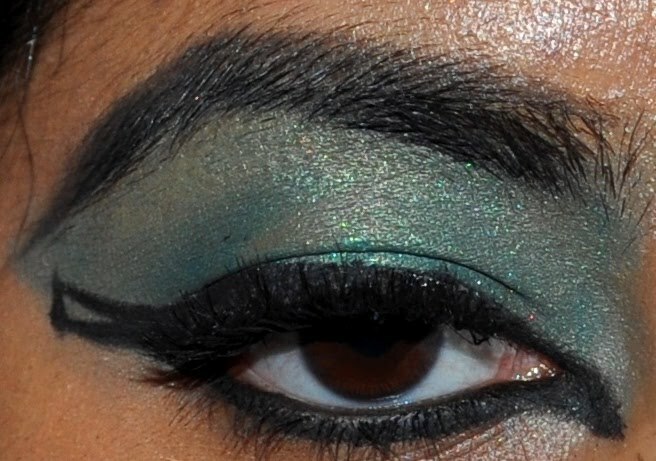 I may end up using a green eyeliner as a base next time I try this look. I decided to bring my eyeliner down past my tear duct as it gives it a more dramatic and feline look which I love. I used Ardell Wispies false lashes but I don't think they were dramatic enough so I would definitely go for a more dramatic lash when I do the real thing. 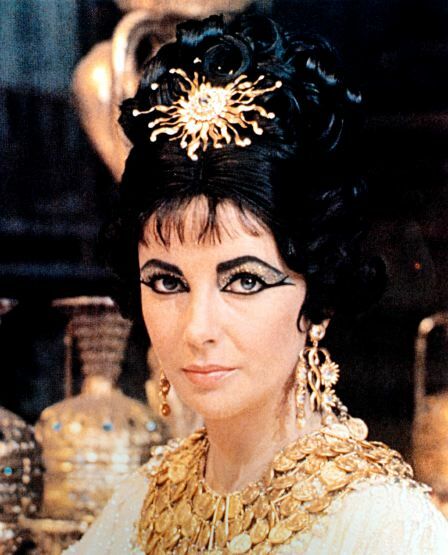 Strong brows are necessary for a Cleopatra look so I used my MAC Blacktrack fluidline gel liner and used it to fill in my brows and exaggerated the shape a bit to make them look fuller.